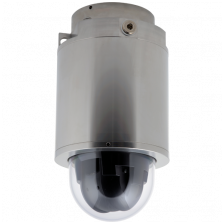 D201-S XPT Q6055 Explosion-Protected PTZ Network Camera is an easy-to- install and easy-to-integrate dome-style camera. It delivers the sweeping overviews and superb zoomed-in detail you expect from a top-of-the-line PTZ camera from Axis. All wrapped up in a patented, stainless-steel housing that’s certified for Class I, Division 1 and Zone 1 for explosion-prone applications, so you can effectively monitor hazardous areas at a lower cost compared to traditional explosion-protected PTZ cameras. PoE-powered for plug and play installation, D201-S XPT Q6055 weighs less than a traditional explosion-protected PTZ. And that means significant savings because you won’t need electricians and a 3-person crew to install it. In particular, the camera’s low weight makes it easier to install and manage on oilrigs, where heavy winds present a challenge. The casing is prepared for American Petroleum Institute (API) DROP compliance, with additional safety wire for US offshore installations. All the moving parts of D201-S XPT Q6055 are protected inside its steel housing, and the power source (provided by the included AXIS T8154 60 W SFP Midspan) is located in a dedicated junction box �C on the ground. So there are fewer possible points of failure, and troubleshooting is easier. The SFP slot in AXIS T8154 60 W SFP Midspan allows for long-distance fiber-optic connection.